LIFE, etc. : What A Wonderful World! I apologize for my apathetic blogging as of late. I have been.... well, let me tell you some of the highlights of the past... erm... month. Wow. It really has been a while since I have been on the blogosphere. 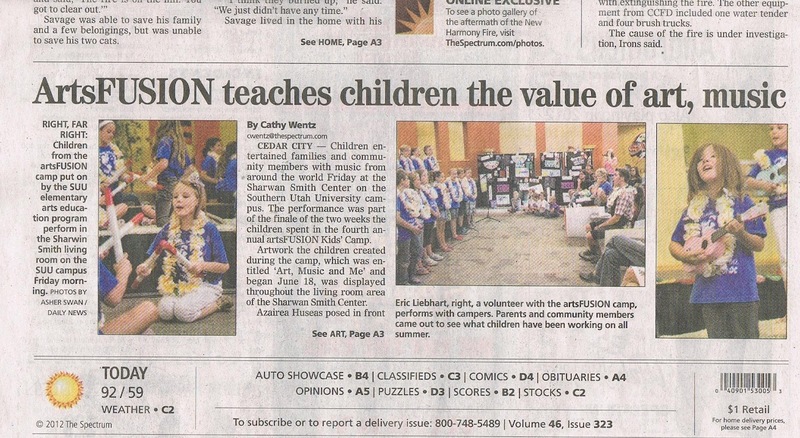 I had the privilege to work at SUU's ArtsFusion camp for children. 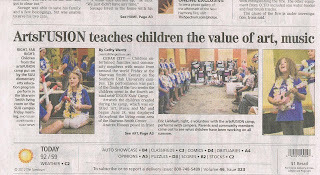 I was teamed up with choral mastermind Adrienne Tawa and we taught choir to children ages 8 to 12. The theme of the camp this year was.... something about global, so we did a Chinese song (in Chinese! The kids were so talented! ), a titi torea Maori piece while playing a traditional stick game, the English version of Pearly Shells from Hawaii, What A Wonderful World, and One Small Voice from Sesame Street. It was a blast working with the wonderful faculty and helping me further my experience in teaching music. My picture was on the front page of the paper for it. I'll post it later if I kept it... I'm not sure if I did [Mom kept it! Here it is!]. I would like to add, for the record, that I was not a volunteer; I was a paid employee. That is all. Mom and dad went to Canada. I didn't go. I was working at ArtsFusion and house sitting. I took Caroline, Lexi, and Braeden hiking in the Kanarra Creek slot canyons. I sang in the interfaith choir for a patriotic concert. It was a wonderful program. I spent a day in Temecula, CA to trade vehicles with dad and play with Damian and Tandy's kids. I flew from Cedar to Reno to visit Katie and her family and help them settle in to their new home and watch the boys. The first leg of my trip was from Cedar to Salt Lake. When I got situated on the plane, I turned to the man sitting next to me and said, "Hello, my name is Eric. I will be sitting next to you for the duration of the flight." The man looked at me coldly and said disdainfully, "It's a short flight, Eric." And he looked away from me and put his nose in his newspaper. Ouch. The second leg of my trip was from Salt Lake to Reno. The person I sat next to on that flight was a delightful young woman from Indianapolis who grew up in Reno and was returning to visit her family because her grandmother was dying. We talked for the whole one hour flight. As we talked, the subject of religion came up and we were able to talk a lot about the Church. Not so much doctrine, but she just reminisced about the great friends she had in high school who were members of the Church and the great impact they had on her life. That conversation made me grateful for faithful, friendly, nonjudgmental members of the Church and it made me want to be better. In church in Reno, I was aimlessly wandering the halls and saw some missionary plaques. One of the plaques was one of the missionaries that I served with in DC! I took a picture of the plaque and sent it to my mission mom. She informed me that he would be coming home on Wednesday. So did what any sensible person would do: I phoned his mom and got the information about his arrival. His family came and got me Wednesday evening and we were able to have an enjoyable (and somewhat stressful; we thought that Elder Lee had missed his connection in Dallas and didn't make to Reno!) evening. And I was able to make some great friends. After spending a week in Reno, we were to make the long drive East on I-80 to Salt Lake to attend Nick's wedding. On the morning of Friday the twentieth, Katie and Casey went to the rental place to pick up the car that Momma Linda so graciously provided for them (Katie and Casey's car was in no condition to make the 500+ mile drive). The rental place would not release the car to Katie and Casey because they did not have a major credit card. They went to another rental place and found out that they could rent a car, but it would need a ridiculous amount of money paid down; money they didn't have. At that point in time, we didn't think we would make it to Salt Lake. I got online to look at flight information. It was freaking expensive for a one way ticket. So I looked at Greyhound which was a much more reasonable amount. The sad thing was that Casey was planning on staying behind to watch the kids so that Katie could fly on and make it to the wedding. Needless to say, we were all stressed out. So were mom and dad. Mom was especially looking forward to having all her children and grandchildren together for the first time in over three years so that she could do family pictures. Well, mom and dad were very helpful and wired money to Katie and Casey to make it possible for them to afford a car to drive to Salt Lake. When we arrived in Salt Lake, Katie's room reservation had been lost. The good news is that the hotel didn't charge for the hotel because of their mistake. Yay for saving $200+. Nick's wedding. It was great. It was great being with my family who I love so much. On Sunday morning, I woke up at 0330 to take my parents to the airport so that they could fly to Puerto Vallarta for a vacation at the time share. I got back to the hotel at around 0530, slept for another 1.5 hours, woke up, got ready for church, ate breakfast, straightened the room a bit (so that the maid wouldn't think we're complete slobs...), and checked out. I went to church at the county juvenile detention facility because my first mission president and his wife are called to work there. It started at 0830 and we were done by 1100. The kids are good kids and want to change. Definitely and eye opening experience. One of the highlights was administering the sacrament with President Mansell. So good. I was supposed to meet a friend downtown at temple square for a picnic, but she had some family things she had to take care of. So I spent a couple of hours on temple square, enjoyed the gardens, the new scale model of the temple, the art, an organ recital, and talked to some great people. The evening was spent with some of my favorite people ever. Elder and Sister Bingham were missionaries in the Anacostia ward and I consider them family. We had dinner, talked, watched the Mormon Tabernacle Choir's Pioneer Day concert, and just had a grand ol' time. Doesn't that look like a grand ol' time? 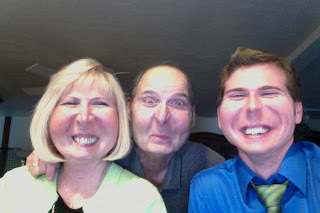 This was taken on PhotoBooth using the Squirrel setting. This is, like, the longest blog post I've ever done. And there's not even any pictures. Sad day. I'm sure as I procure them, I will post them to make this post a little more enjoyable. Thanks for reading about my goings on for the past few weeks.